25th November is the International Day for the Elimination of Violence against Women. At Cardiff's Chapter Arts Centre last week, Cardiff Women's Aid held an event to celebrate their inaugural short story and poetry competitions. I was delighted to be asked to attend and read my winning story, 'Soft Tissue', to an audience of writers, people working with survivors of violence, and Cardiff's Assembly Minister Julie Morgan who presented me with this lovely trophy and a copy of the competition anthology. The theme of the competition was 'domestic violence'. It was sobering to be confronted with so many different accounts of abuse, control and (sometimes) survival. The work collected in the anthology is funny, sad, moving and well worth seeking out. 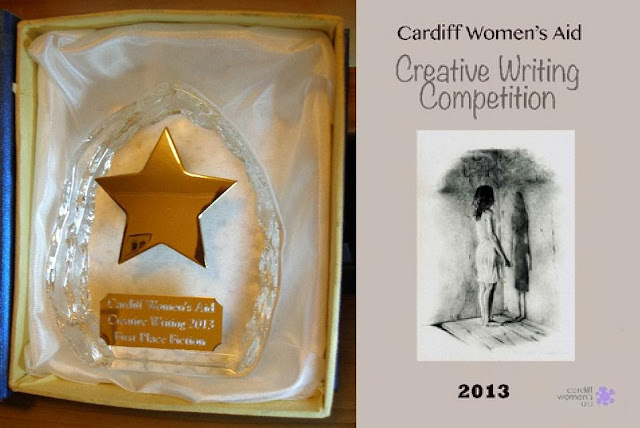 Cardiff Women's Aid Creative Writing Competition 2013, ISBN 9781291615722, available from Lulu.com.